It’s time once more for some TLCB history. This is a Russian T34-85 tank, the most-produced tank of the Second World War and the second most-produced tank of all time. Whilst America’s contribution to the outcome of WW2 cannot be underestimated, it was not America, nor the British, that first rolled into Germany to end the conflict. It was the Russians, who made the biggest sacrifice of anyone – with more casualties than the US, UK, France, Japan and Germany combined – that got there first, thanks largely to this vehicle. Over 84,000 T34s were built, and they remained in service within the Soviet Union until the late 1960s. Which makes this tank’s role in humanity a muddled one. It is possibly the vehicle with the single biggest contribution to the liberation of people, helping to end the Nazi oppression of millions, only to be re-purposed post-war as a tool of the Communist regime to oppress millions itself. How awful it must have been to escape the tyranny of Nazism in Eastern Europe to then be shackled by Communism a few short years later. Still, much as we dislike megalomaniacal, nationalistic, homophobic, war-mongering Russian presidents (and we may not just be talking about Stalin here), Russia’s sacrifice for peoples’ freedom is perhaps the most remarkable and incredible of any country in all of history. Without the T34 tank Russia’s story, and the story of the World, may have been very different. 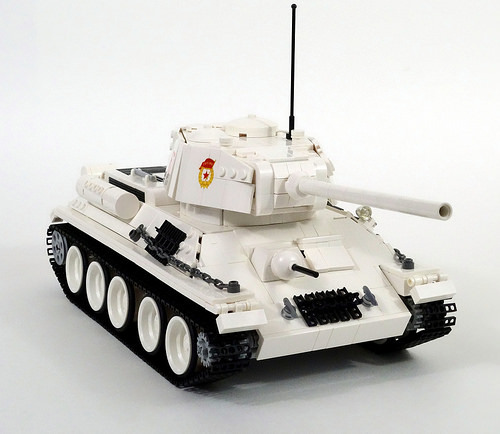 The Lego T34-85 featured here is the work of previous bloggee LegoMarat. 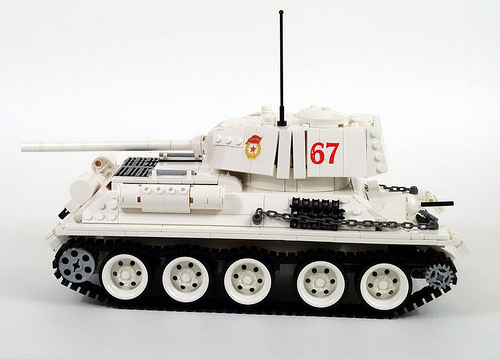 It has four motors (controlled by the third-party SBrick, allowing operation via mobile device) which power the tracks, turret rotation and gun elevation, plus an authentic working recreation of the T34’s clever suspension system. There’s lots more to see on Flickr – click the link above to make the jump.